Pink Umbrella Photography: Make Your Own Paper Leaf Wreath!! Make Your Own Paper Leaf Wreath!! When you see wreaths it means the holidays are getting closer and I do love the holidays. I found this really cute fall wreath idea over at Martha Stewart Crafts and her instructions are really easy and step-by-step. There is even a leaf templet. what a simple, beautiful piece. thanks for sharing! This is gorgeous! 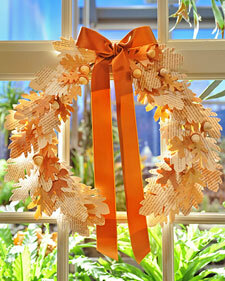 I've been adding book page leaves to my fall garlands and love the contrast and colors. This is so pretty. Glad you all are liking this. Its really cute and super simple. Love this wreath! So pretty. Nice! Thanks for sharing it at the Rock N Share!